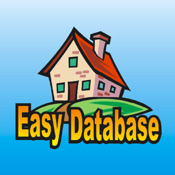 Easy Database is a very easy to use database app. There are 10 predefined databases. Use one or all databases. Just choose your database and start filling in information right away! You dont need to worry about setting up field types and labels. There are 10 different databases to choose from. Each inventory has predefined names that are related to that category. Instructions are built into the app so they are always for you to read. The Custom database allows you to define the field names. This can also be done in almost any language. Note: If you are an experienced database user and well versed in databases this app is not for you, so please dont buy it. You will be unhappy with how easy to use and the lack of 50 different ways to manipulate a database. But thats the beauty of this app. its easy to use! However, Easy Database will let you e-mail a coma delimited file of any or all databases. This way you can import the database into a PC or Mac database or spreadsheet program.